The FBI has launched a massive worldwide hunt for Edward Snowden, the 29-year-old NASA contractor who has turned the massive U.S. intelligence community inside out. NBC's Andrea Mitchell reports. The 29-year-old computer whiz who says he divulged details about National Security Agency's data-collecting programs has also revealed specifics of his life story, from an upbringing in North Carolina to a top-secret contract in Hawaii. Speaking from a Hong Kong hotel that he reportedly has since left, Edward Snowden told The Guardian that he had enjoyed a "very comfortable life," but one marked by mounting disillusionment with what he views as government intrusion into the private lives of American citizens. "I don't want to live in a society that does these sort of things … I do not want to live in a world where everything I do and say is recorded. That is not something I am willing to support or live under," he said. The demand for private intelligence contractors grew quickly after 9/11, leading to a large number of young, smart hires, many of whom have top secret clearances. Now, intelligence agencies say they could not function effectively without the expertise of these hires. NBC's Lisa Myers reports. Background: Born June 21, 1983, he grew up in Wilmington, N.C., but later moved to Ellicott City, Md., he told The Guardian. His mother, Wendy, is the chief deputy clerk for administration and information technology at the federal court in Baltimore, a court official told NBC News. His father, Lonnie, is a former Coast Guard officer who lives in Pennsylvania, the Allentown Morning Call reported. A neighbor said he has an older sister who is an attorney. "He was a quiet guy, kept to himself. He always dressed nice, was clean cut. He just reminded me of a brainiac," said neighbor Joyce Kinsey. "I feel terrible for his family." In his interview with The Guardian, Edward Snowden said the only thing he feared from outing himself is the "harmful effects on my family." Education: He did not complete high school. He told The Guardian that he studied computers at a community college and obtained a general equivalency degree. A spokesman for Anne Arundel Community College confirmed that a student with the same name and birth date took classes there, from 1999 to 2001 and again in 2004 and 2005. Military service: He spent four months in the Army reserves, from May to September 2004 as a special forces recruit to a 14-week training course, the Army said. "He did not complete any training or receive any awards," an Army statement said. No other details were given, but Snowden told The Guardian he was discharged after breaking his legs in an accident. Government work: His first job with the National Security Agency was as a security guard, and the next stop was an information-technology job with the CIA, which stationed him in Geneva in 2007, he claimed. He said he left the CIA in 2009 to work for private contractors, including Dell and Booz Allen. Through his job with Booz Allen, he was assigned to NSA offices in Japan and, more recently, Hawaii. Booz Allen said he has been an employee for about three months. He told reporters he made about $200,000 a year. 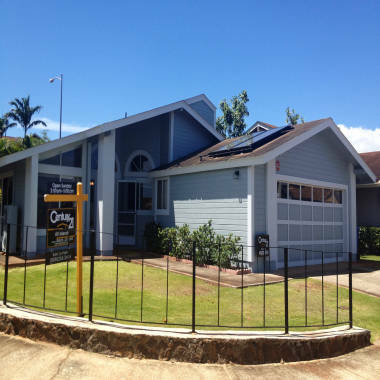 A real estate sign stands in front of a home in Waipahu, Hawaii, Sunday, June 9, 2013, where Edward Snowden, source of disclosures about the U.S. government's secret surveillance programs, lived with his girlfriend until recently. A Hawaii real estate agent says Snowden and his girlfriend moved out of the home near Honolulu on May 1, leaving nothing behind. Hawaii: He briefly lived in a 1,559-square-foot rented home on Oahu, where neighbors said he and his girlfriend, who has not been named, kept to themselves. "They just say, 'Hi' and 'Hello' in the morning," Angel Cunanan told NBC station KHNL. "He mentioned that he worked for the government." Local residents said the couple never really unpacked before they moved out May 1, after the owner decided to sell the house, the Associated Press reported. Exit plan: When he decided to go to Hong Kong to await the fallout from the leaks, Snowden told the NSA that he was taking a leave for treatment of epilepsy, a condition he told The Guardian he was diagnosed with last year after seizures. He said he didn't give his girlfriend a specific reason, just saying he had to go away for a few weeks. Politics: A public records search shows Snowden was a registered voter but did not declare a political party affiliation. Someone with the same name who lived in the same places and at one point worked for Dell made two $250 donations last year to libertarian-leaning GOP presidential candidate Ron Paul. Cloak-and-dagger: Snowden self-identifies as a spook. "I've been a spy almost all of my adult life," he told the Washington Post. In his communications with a reporter, he used a code name — "Verax," or truth-teller in Latin. He's worried he's being watched and puts a red hood over his head and laptop when he enters passwords, The Guardian reported.